Serres F., Chetboul V., Sampedrano C.C., Gouni V., Pouchelon J.L. 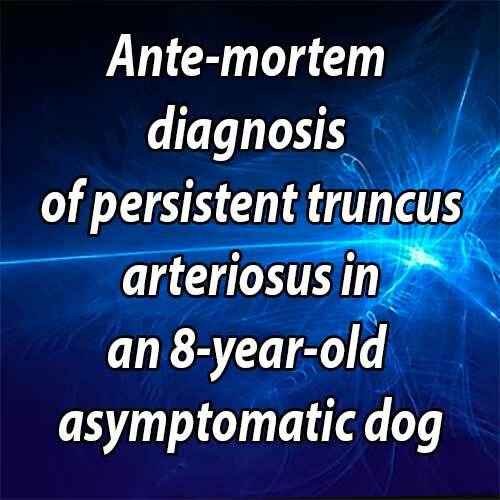 Ante-mortem diagnosis of persistent truncus arteriosus in an 8-year-old asymptomatic dog // J Vet Cardiol. 2009 Jun;11(1):59-65. Persistent truncus arteriosus (PTA) was diagnosed in an 8-year-old neutered male Poodle referred for echocardiographic examination prior to anesthesia for surgical correction of bilateral cataract. A single large artery limited by a bicuspid valve and overriding both ventricles was observed with 2 distinct pulmonary arteries arising from the common arterial trunk. A large size interventricular septal defect was associated with a low velocity bidirectional shunt. The lesion was identified as a Type 3 PTA according to Collett and Edwards' classification. Although no clinical signs were reported, the dog presented polycythemia (packed cell volume=68%) at the time of diagnosis. 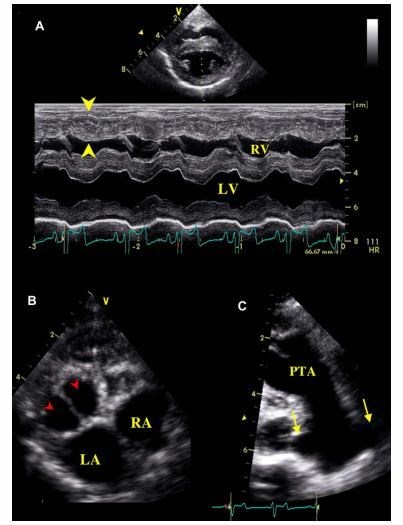 To our knowledge, this is the first report of an echocardiographic diagnosis of PTA in the dog. Until now, the ante-mortem diagnosis of this congenital heart disease has only been described in the cat. This case is also of interest because of the age of the animal and the total absence of cardio-respiratory signs at the time of diagnosis. An 8-year-old 10-kg neutered male Poodle was referred to the Ophthalmologic Unit of the National Veterinary School of Alfort for evaluation of a bilateral cataract of rapid onset. External chest trauma secondary to a dog bite had been reported 4 years previously. The dog had no history of clinical signs related to disease of the respiratory or cardiovascular system. However, its history was incomplete as it had been adopted by the present owner when adult (4 years old). Physical examination was unremarkable except for slightly hyperemic mucous membranes. Cardiac auscultation revealed a grade V/VI right apical systolic heart murmur with normal heart rate (120 beats per minute). Ocular examination confirmed a bilateral cataract associated with lens anterior subluxation and mild uveitis on the left eye. It was decided to perform an electro- retinographic examination before surgical correction of the cataract. The dog was therefore referred to the Cardiology Unit of Alfort for echocardiographic examination to evaluate the cardiac risk associated with the anesthetic procedure. Two-dimensional (2D) echocardiography, color- flow imaging, and spectral Doppler examinations were performed using an ultrasound unitc equipped with 2.2-5 and 3.5-8 MHz phased-array transducers. The dog was unsedated throughout the ultrasound examination and was gently restrained in the standing position as previously described and validated by our group.1 Conventional 2D and M-mode data are given in Table 1. 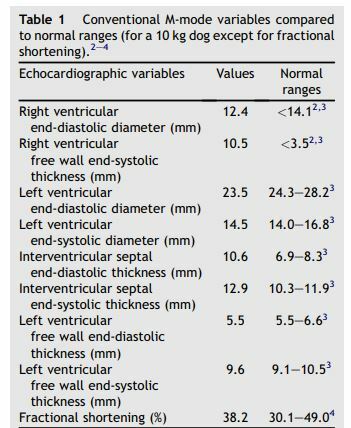 The M-mode echocardiogram showed marked hypertrophy of the right ventricular free wall and the interventricular septum with a slightly decreased left ventricular end-diastolic diameter and a flattened interventricular septum (Figure 1, Table 1). A large defect was identified at the base of the interventricular septum (Figure 2). Color- flow Doppler examination (Figure 2B and C) demonstrated a low velocity bidirectional interventricular shunt (right-to-left in diastole and left- to-right in systole). A single large artery overriding the septum and originating from both ventricles was visualized (Figure 2A). No other artery arising from the left or right ventricle was observed. The single artery had one valve formed by 2 large symmetrical cuspids which were identified on left apical short axis views (Figure 1B). Coronary arteries were identified at the base of the truncus as small sized vessels with dilated ostia and tortuous aspect. Two symmetrical pulmonary arteries arising from both sides of the common arterial trunk were also visualized (Figure 1C). These findings were characteristic of a Type 3 persistent truncus arteriosus (PTA) according to the Collet and Edwards’classification.5 A peak systolic flow velocity through the truncus of 2.6 m/s was identified. Color-flow Doppler examination did not reveal any diastolic insufficiency. Bidimensional echocardiography as well as pulsed-wave and color Doppler mode examination were not suggestive of stenosis of the associated valve. Owing to marked modifications of heart basis morphology, right and left atrial diameters could not be measured using conventional methods. However, the two atrial cavities appeared subjectively normal. 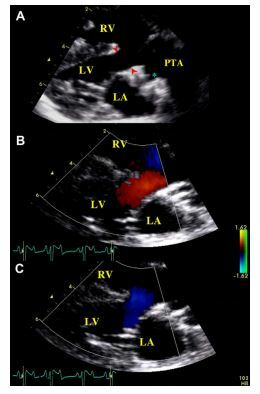 Mitral and tricuspid regurgitations (MR and TR, respectively) with slightly thickened mitral and tricuspid valves were identified using color and continuous Doppler mode applied to the left apical 4-chamber view. Both regurgitations were considered as mild, i.e., with maximal area of the regurgitant jets (on color Doppler mode examination) representing less than 30% of left and right atrial areas, respectively. Continuous Doppler mode examination of these regurgitations revealed high velocity flows (of 6.0 m/s for MR and 6.5 m/s for TR). This was suggestive of similar right and left ventricular systolic pressures, which was consistent with the finding of a large interventricular septal defect and a low bidirectional interventricular shunt velocity. The right ventricular pressure overload also explained the right ventricular concentric hypertrophy observed. A standard 6-lead electrocardiogram showed normal sinus rhythm (heart rate: 125 bpm) with a marked right axis deviation (presence of deep S waves in leads I, II and III). Thoracic radiographs confirmed severe heart enlargement and an associated cranio-ventral mediastinal opacification consistent with the main arterial trunk dilatation. Fractures of the 6th and 7th right ribs, probably secondary to the previous dog bite on right chest, were observed. Serum chemistries and complete blood count were normal except for polycythemia (68% packed cell volume; reference range: 37—54%) and elevated hemoglobin concentration (23 g/L; reference range: 12—18 g/L). The owner decided to postpone the surgical treatment of cataract. At follow-up, 2 and 12 months later, the dog was still doing well. Clinical examination, complete blood count and Doppler echocardiography remained unchanged, except for the appearance of a mild truncus valve insufficiency. (A): M-mode examination of the right parasternal transventricular short axis view showing right ventricular concentric hypertrophy (arrow heads). (B): Left parasternal short axis view of the heart showing the bicuspid valve (arrow heads) of the PTA. (C): Right parasternal long axis view of the persistent truncus arteriosus (PTA) showing 2 pulmonary arteries arising from the common artery (arrows). LA: Left atrium. LV: Left ventricle. RA: Right atrium. RV: Right ventricle. PTA: Persistent truncus arteriosus. (B and C): Color-flow Doppler mode examination of the interventricular defect assessed on the same view. (B): Left-to-right systolic shunt. (C): Right-to-left diastolic shunt. LA: Left atrium. LV: Left ventricle. RA: Right atrium. RV: Right ventricle. Persistent truncus arteriosus (PTA) is a rare congenital heart disease defined as a single great artery that originates from the base of the heart and gives rise to the pulmonary, systemic, and coronary circulation.6,7 Persistent truncus arteriosus belongs to a complex range of congenital abnormalities related to various conotruncal malformations, and has been mostly described in humans with a low incidence of about 0.5—0.9 per 10,000 live births.6,8 The few descriptions of persistent truncus arteriosus (PTA) in mammals relate to monkeys,9 cats10—12 and dogs.13—17 Most PTA cases in dogs have been described in Keeshounds or Keeshound-related dogs13—16 with a specific focus on anatomical and histopathological characteristics of the defect and its genetic features rather than ante-mortem characteristics. In this canine breed, the mode of heritability of conotruncal defects was first thought to be related to a single major gene with autosomal recessive transmission15 with modifying loci influencing disease severity. However, it was hypothesized in a more recent study that the mechanism was more likely oligogenic.16 A case of persistent truncus arteriosus (PTA) identified by necropsy has also been described in a 2-month-old miniature Schnauzer dog,17 but to our knowledge, this is the first description of persistent truncus arteriosus (PTA) in a non-Keeshound or Keeshound-related adult dog. Additionally, to the best of our knowledge, the echocardiographic findings associated with PTA have never been described in the dog before the present report. In humans, persistent truncus arteriosus (PTA) originates from the right ventricle in 42% of cases, from both ventricles in 42% (as in our case), and from the left ventricle in 16%.18 Various congenital cardiac abnormalities have been reported to be associated with PTA in humans too, including truncal stenosis or insufficiency, interrupted aortic arch, persistent right aortic arch, aortic coarctation, abnormal pulmonary venous return, patent foramen ovale, and coronary artery abnormalities (single coronary artery or displacements of coronary ostia).18—21 The latter are some of the most common defects associated with persistent truncus arteriosus (PTA), and have been reported in up to 30% of cases in humans.18—21 Similarly, in the case described here, PTA was associated with both abnormal coronary arteries and systolic atrioventricular regurgitations. However, it cannot be stated for certainty that the latter were not just concurrent acquired valvular abnormalities. (A): Type 1 PTA, a single pulmonary trunk and a single ascending aorta arise from the truncus arteriosus. (B): Type 2 PTA, two pulmonary arteries arise close together from the dorsal wall of the truncus. (C): Type 3 PTA, pulmonary arteries come off either side of the truncus. (D): Type 4 PTA, there is no visible pulmonary artery (pulmonary circulation is provided by the bronchial arteries). Ao: Aorta. LA: Left atrium. LV: Left ventricle. PA: Pulmonary artery. RA: Right atrium. RV: Right ventricle. 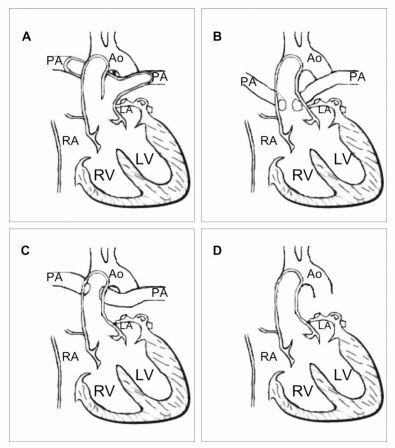 Surgical correction of persistent truncus arteriosus (PTA) consists of closure of the interventricular septal defect with connection of the truncus to the left ventricle and connection of the pulmonary arteries to the right ventricle using a valved conduit, the latter being either a homograft or xenograft. The prognosis is good for such surgical treatment in humans.19,23 However, survival relies on age at diagnosis and the presence of associated cardiac abnormalities, which may reduce survival at discharge from 91 to 71%.19,23 However, despite major improvements in cardiac surgery, one-third of human patients remain symptomatic after surgery and re-operations are necessary in almost half of them.19,23 As the dog described here was relatively aged, presented no clinical signs and had concurrent abnormal coronary arteries, such a surgical treatment, which has not been described to date in domestic animals, was not proposed. In conclusion, this case report illustrates that a complex and cyanotic congenital heart disease such as persistent truncus arteriosus (PTA) may be an incidental finding and may also be associated with long-term survival in the dog as already described in humans.24,25 This case is also of interest because it is the first reported echocardiographic and Doppler description of such a malformation in the dog. This report was supported by the resident grant program of Vetoquinol Pharmaceutical Laboratory, Lure cedex, France. Chetboul V, Athanassiadis N, Concordet D, Nicolle A, Tessier D, Castaignet M, Pouchelon JL, Lefebvre HP. Observer-dependent variability of quantitative clinical endpoint: example of canine echocardiography. J Vet Pharmacol Ther 2004;27:49—56. Boon JA. Evaluation of size, function and hemodynamics. In: Boon JA, editor. Manual of veterinary echocardiography.. Baltimore: Williams & Wilkins; 1998. p. 151—260. Goncalves AC, Orton EC, Boon JA, Salman MA. Linear, logarithmic, and polynomial models of M-mode echocardio- graphic measurements in dogs. Am J Vet Res 2002;63: 994—999. Chetboul V, Carlos Sampedrano C, Concordet D, Tissier R, Lamour T, Ginesta J, Gouni V, Nicolle AP, Pouchelon JL, Lefebvre HP. Use of quantitative two-dimensional color tissue Doppler imaging for assessment of left ventricular radial and longitudinal myocardial velocities in dogs. Am J Vet Res 2005;66:953—961. Collett RW, Edwards JE. Persistent truncus arteriosus: a classification according to anatomic types. Surg Clin North Am 1949;29:1245. Mair DD, Edwards WD, Julsrud PR, Seward JB, Danielson GK, Goldmuntz E. Truncus arteriosus. In: Allen HD, Gutgesell HP, Clark EB, Driscoll DJ, Baltimore MD, editors. Moss and Adam's heart disease in infants, children and adolescents. 6th ed. Philadelphia: Lippincott Williams & Wilkins; 2001. p. 869—879. Kittleson MD, Kienle RD. Other congenital cardiovascular abnormalities. In: Kittleson MD, Kienle RD, editors. Small Animal cardiovascular medicine. Saint Louis: Mosby; 1998. p. 282—296. Marelli AJ, Mackie AS, lonesco-Ittu R, Rahme E, Pilote L. Congenital heart disease in the general population: changing prevalence and age distribution. Circulation 2007; 115:163—172. Brandt DJ, Canfield DR, Peterson PE, Hendrickx AG. Persistent truncus arteriosus in a rhesus monkey (Macaca mulatta). Comp Med 2002;52:269—272. Buergelt CD, Suter PF. Persistent truncus arteriosus in a cat. J Am Vet Med Assoc 1968;153:548—552. Nicolle AP, Tessier-Vetzel D, Begon E, Carlos Sampedrano C, Pouchelon JL, Chetboul V. Persistent truncus arteriosus in a 6-year-old cat. J Vet Med A Physiol Pathol Clin Med 2005; 52:350—353. Chuzel T, Bublot I, Couturier L, Nicolier A, Rivier P, Mai W, Cadore JL. Persistent truncus arteriosus in a cat. J Vet Cardiol 2007;9:43—46. Van Mierop LH, Patterson DF, Schnarr WR. Hereditary conotruncal septal defects in Keeshond dogs: embryologic studies. Am J Cardiol 1977;40:936—950. Van Mierop LH, Patterson DF, Schnarr WR. Pathogenesis of persistent truncus arteriosus in light of observations made in a dog embryo with the anomaly. Am J Cardiol 1978;41: 755—762. Patterson DF, Pexieder T, Schnarr WR, Navratil T, Alaili R. A single major-gene defect underlying cardiac conotruncal malformations interferes with myocardial growth during embryonic development: studies in the CTD line of Keeshond dogs. Am J Hum Genet 1993;52: 388—397. Werner P, Raducha MG, Prociuk U, Ostrander EA, Spielman RS, Kirkness EF, Patterson DF, Henthorn PS. The keeshond defect in cardiac conotruncal development is oligogenic. Hum Genet 2005;116:368—377. Chen HC, Bussian P, Whitehead JE. Persistent truncus arteriosus in a dog. Vet Pathol 1972;9:379—383. Butto F, Lucas RV, Edwards JE. Persistent truncus arteriosus: pathologic anatomy in 54 cases. Pediatr Cardiol 1986;7: 95—101. Brown JW, Ruzmetov M, Okada Y, Vijay P, Turrentine MW. Truncus arteriosus repair: outcomes, risk factors, reoperation and management. Eur J Cardiothorac Surg 2001;20: 221 —227. Lenox CC, Debich DE, Zuberbuhler JR. The role of coronary artery abnormalities in the prognosis of truncus arteriosus. J Thorac Cardiovasc Surg 1992;104:1728—1742. De la Cruz MV, Cayre R, Angelini P, Noriega-Ramos N, Sadowinski S. Coronary arteries in truncus arteriosus. Am J Cardiol 1990;66:1482—1486. Deshpande J, Desai M, Kinare S. Persistent truncus arteriosus - an autopsy study of 16 cases. Int J Cardiol 1992;37:395-399. Williams JM, de Leeuw M, Black MD, Freedom RM, Williams WG, McCrindle BW. Factors associated with outcomes of persistent truncus arteriosus. J Am Coll Cardiol 1999;34:545-553. Bodi V, Insa L, Sanchis J, Ibanez M, Losada A, Chorro FJ. Persistent truncus arteriosus type 4 with survival to the age of 54 years. Int J Cardiol 2002;82:75-77. CarvalhoG, SilvaAA, Bestetti RB,Leme-NetoAC. Long-term survival in truncus arteriosus communis type A1 associated with Ehlers- Danlos syndrome - a case report. Angiology 2002;53:363-365.